Review of the iClear electronic cigarette starter kit last from CigElectric. A great starting kit with 2 quality electronic cigarettes that deliver high performance for a low cost. I have been using the iClear as my main vaping device for the last several days. The iClear electronic cigarette is very compact boosting a 650mah battery and an iClear single coil clearomizer. The kit consists of 2 batteries, 2 iClears, 1 USB charger, 1 bottle of 10ml e-liquid and a large zip case. I have tried many different clearomizers, some good, some really bad. The majority tend to have some sort of wicking problem where if used too much can lead to dry burns and really harsh hits. Not so with the iClear. From the first fill it was giving really nice vapour. It makes a real crackling sound which I normally only got with the high end variable voltage models. The vapour production seriously rivalled some of my favourite devices and as a entry level clearomizer this was very impressive. I tried to push it to its limits by chain vaping it for several minutes. I didn’t get a single dry hit, just heavy vapour production and nice throat hit. I tried the iClear back to back with another device and the flavour that came through the iClear was really clean. None of that ‘metal’ taste that I have had with a lot of clearomizers. The flavour was slightly muted compared to straight dripping which of course was to be expected, but the difference was very little. All in all I was very impressed with the flavour and vapour produced by the iClear. 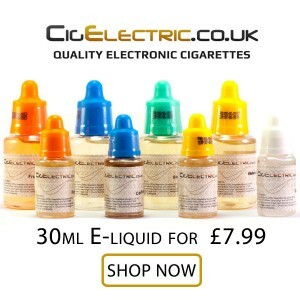 I used the e-liquid that came with the iClear electronic cigarette, CigElectric branded 18mg Blended tobacco flavour. I normally avoid tobacco flavours but I did enjoy this one. The throat hit was really strong (maybe even too much for my taste) but would be great for someone trying to replace their cigarette habit with an e-cig. A nice 650mAh eGo style battery. I had no problems with it. A sturdy button and nice 5 click on / 5 click off locking feature. 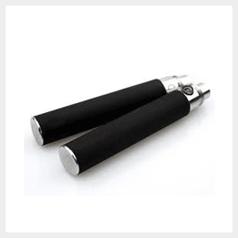 It sits flush with the clearomizer making the iClear electronic cigarette look quite attractive. It was nice to see a quality case included with the iClear electronic cigarette. I was expecting the sunglasses shaped case that I see with most starter kits but this one was a lot flatter and wider allowing some more space for all your stuff. It had a nice logo embossed on the top and had loads of room for all the starter kit pieces with space for quite a bit more e-liquid and spare parts. All in all I really liked the iClear electronic cigarette starter kit. For the price I don’t think you can find one better. There are some poor quality kits at a much higher price. If I was looking for a great starter kit to suggest for a first timer to give them a nice and easy introduction to vaping I would defiantly recommend this one. This kit probably has the best clearomizer I have tried to date. Really nice vapour production and great flavour. I will defiantly be getting more of these to use when out and about. The iClear electronic cigarette is nice and compact and easy to carry. The 5 click on/ off safety feature means it wont accidently turn on while in your pocket. One battery will easily last a medium user 1 or 2 days before needing charging. I will defiantly be adding this kit to my own collection, I suggest you do too. 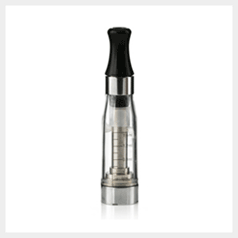 The iClear electronic cigarette starter kit is available Here.